Work hard, play hard is the way we do thing here at The New Collections, so when we had the chance to be a part of the Luke Sport 5th Annual Golf Day how could we say no; especially when its for a good cause. Friday 22nd July marked the 5th annual Golf Day in association with the John Hartson Foundation, a fantastic charity that runs the ‘Grab Life by The Balls’ campaign. This year the Luke family once again descended on The Welcombe Golf Club, Stratford-Upon-Avon along with a myriad of celebrities, customers, friends and family to celebrate 15 years in the business. 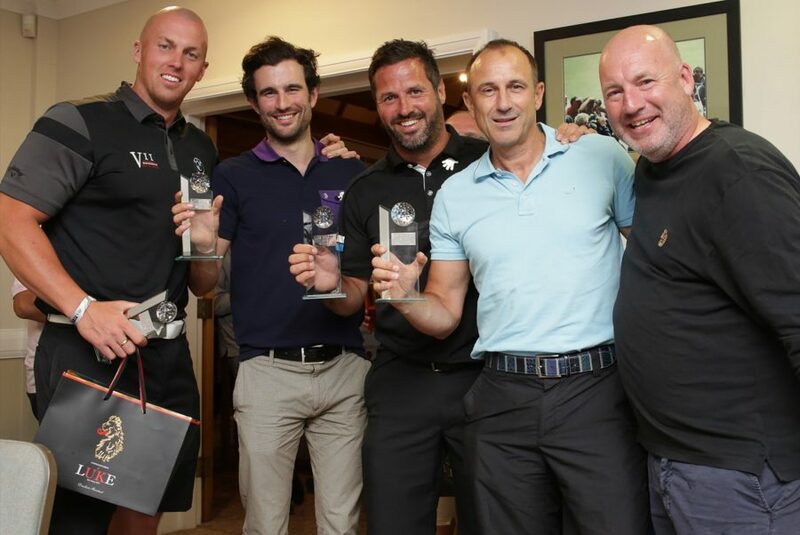 With the likes of John Hartson, Ben Hanlin and Dean Saunders along with European Tour Pro’s such as Mark Foster and Stuart Manley playing alongside customers including Accent, You Fashion and Terraces the day was a huge success. Two shotgun starts (8am and 1.30pm) broken up by the infamous Luke Halfway House of Heaven (or hell). Here the guests could take the time to enjoy a few refreshments from Thornbridge Brewery and the Bacardi Bar, chow down on incredible samosas from Nick’s Tandoori Nights and slow-cooked smoky burgers from Low N Slow, or take a soaking from the prosecco water gun and the golfing devil himself. The day really put the pros (and amateurs) to the test with a variety of great prizes up for grabs, including a £15k cash for a Hole in One on hole 9, a 3 night Golf Day holiday at The Praia del Rey Portugal and Limited edition Luke Sport x Titleist Pro V1 balls. A few beers in and the evenings entertainment started. We had World Long Drive Champion Joe Miller show us his longest drive and other tricks, and presentation of the day’s winners (congratulations Team Miller!) before heading to the Shakespeare 1 club for the exclusive Luke Golf Day After Party. Here, we had a live PA from K Klass, the incredible Grand Master Ash and a jaw dropping live fire performance from Arabella Drummond. Needless to say, this was a favourite with the boys! It would be a fair comment to say the drinks were flowing freely throughout the day and night with the Grey Goose flowing through the infamous Luke ice luges. It really was a fantastic day and we want to give a huge thank you to everybody that supported the day, which raised over £5000 for the charity.